Hulu is an online video service that offers a selection of hit shows, clips, movies and other ad-supported and on demand shows from 260 content companies, including NBC, FOX, ABC and many other networks and studios. All content can also be watched through their ad-supported subscription service, Hulu Plus. Hulu’s mission is “to help people find and enjoy the world’s premium video content when, where and how they want it. As we pursue this mission, we aspire to create a service that users, advertisers and content owners unabashedly love”. Hulu videos are currently offered only to users in Japan and the United States and its overseas territories. The overall design is simply yet visually pleasant. The homepage is clean and straightforward, easy for users to find categories they want to watch. Search bar is on the top right, and by logging in, users can simply find their favored clips listed on the right side. The majority of Hulu’s audience is evenly distributed between men and women in the 18-49 age range. Hulu generates revenue from advertising sales, and Hulu Plus is an ad-supported subscription service which allows our customers to watch Hulu content in other devices beyond the PC, including Internet-connected TVs, gaming consoles, set-top boxes, mobile phones and tablets. 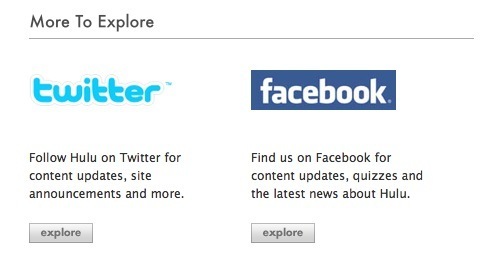 Hulu has its own blog, Facebook and Twitter accounts marked on its homepage for users to make connections. Also, all of its content are easy to share with share buttons.